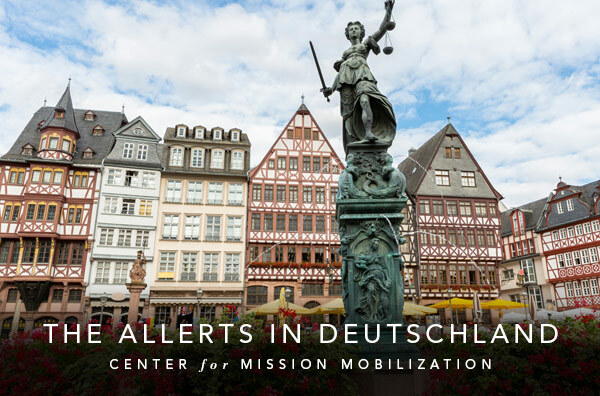 The Allert family works under the umbrella of The Center for Mission Mobilization as they serve in Frankfurt Germany, reaching out to millions of displaced peoples from unreached and inaccessible Muslim countries who are seeking refuge here. John and his team have the privilege of training new believers from these countries to start mission movements within Muslim communities both here and back home. They also seek to build mission movements within the German church toward these unreached peoples right in their midst. Pray that the team would welcome, set up, and assimilate new team members and that the new team members would transition and quickly learn the language. Pray for continued good health and an increase in fruitfulness. Pray that the team would each be coaching 15-20 people by year end in the areas of mobilization and multiplying discipleship. Pray for the team to grow as distance coaches (most refugees move several times), T4T coaches (a disciple-making curriculum), and grow their Arab/Persian cultural IQ (be able to think/act more like them). Pray for the completion of German B level (Equivalent of 2 more years) so the team is able to teach in German. All refugees are required to learn German to be able to stay. Pray for the recruitment of two more men and Catalytic team to work regionally across western Europe.